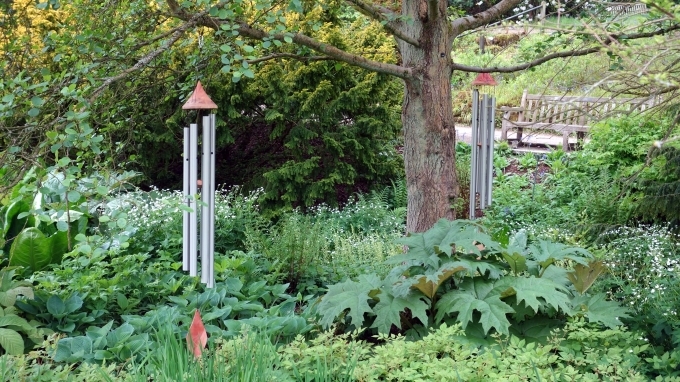 Since 1992, my aim has been to produce chimes which are truly sculptural, and beyond anything available elsewhere. The hand-turned spire and leaf-shaped fin are my trademarks. The current model is 7ft long from the custom-made brass hanging ring down to the tip of the fin. 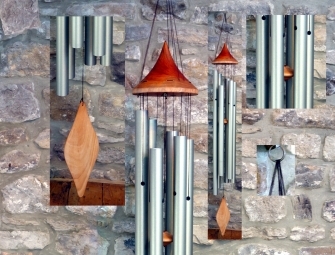 The bells are of musical instrument quality and tuned to a pentatonic sequence in G, but other scales are also available. Previous designs have been placed in homes, gardens and galleries in many parts of the world, and several have been purchased as wedding presents. Because of their sculptural qualities, they are sometimes placed indoors so people can touch them and set them ringing. I work from my home in the Yorkshire Dales, having originally developed the designs in Devon in the early 1990s.